My favourite episode. Originally shown on 15 November 1965 and not seen by this reviewer until its DVD release. 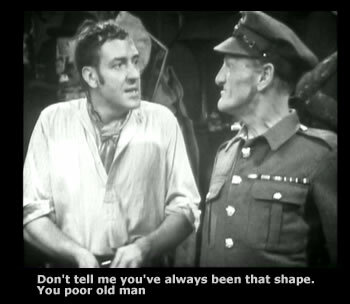 If Steptoe is the social soundtrack for the working class then this is the ultimate working class comment on Allied Relations following both world wars. The show opens with Albert in his First World War uniform preparing for a pilgrimage to the battle fields of WW1. The common threads of Albert needing to have his own way before he dies and Harold missing yet another holiday are both there. Some excellent exchanges of dialogue show that Harold feels the same way as Albert and that both generations were fooled by the governments of their times. As usual though Albert has to have the upper hand by insisting WW1 was a real war! Once on the plane Harold delights in joking about Albert's fear of flying only for Albert to retaliate with Harold's fear of spiders. Albert is wearing his medals with pride and attracts the attention of an American passenger. What follows is absolute farce riddled with xenophobic insults about the Americans always being late. Further comments about the French and French women lead to a Frenchman joing the melee to defend the honor of his country. 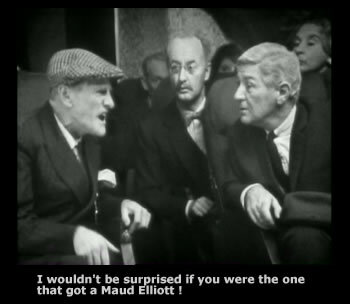 An all out punch up follows leading to the Steptoe's arrest and deportation as undesirables thus ending Harold's plans for St Tropez! The show ends with Albert dressed in Arabian gear planning another pilgrimage to another of his battlegrounds in North Africa. Excellent stuff indeed. For further views on Anglo American war relations see The World At War or A Matter of Life and Death. Both of which highlight Albert's patriotic view and dare I say it that of his generation.